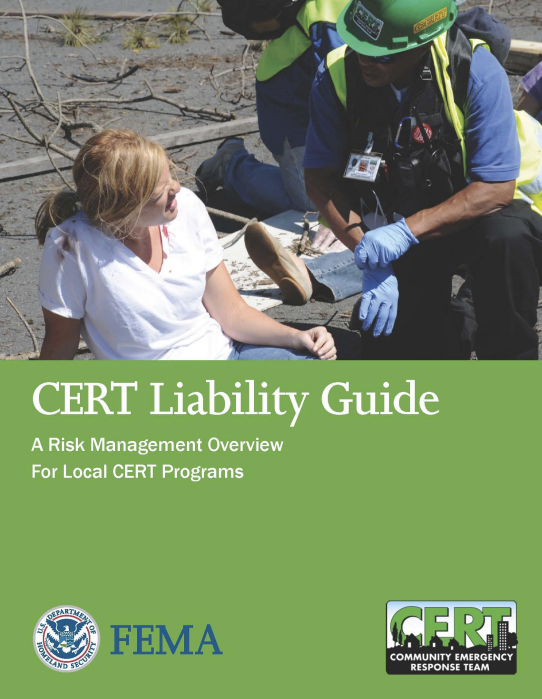 Recently, several local agencies partnered with the national CERT program to release the CERT Liability Guide: A Risk Management Overview for Local CERT Programs. I’ve been a volunteer with the Montgomery County, MD Community Emergency Response Team (CERT) since March of this year and recently completed the CERT instructor course. I think the CERT program is one of the most proactive training and outreach programs available to local government and I firmly believe in the potential for CERT to expand and mature in the future. In other words, currently there’s no evidence that CERT programs are more prone to lawsuits or liability than other similar volunteer programs within local government. It’s probably best if the emergency management agency for each state were to conduct a review (usually with the Attorney General) of the liability implications for CERT programs and issue guidance using the specific laws, requirements, and exclusions specific to the respective state. Benefits of Risk Management (Pages 3-4) include “confidence in the program, positive public image, reduced expenses, reduced insurance costs, preservation of the CERT program’s investment in members, increased participation in CERT”. There is little doubt that having a formal risk management process is helpful to an agency–if continued conscientiously. Many times volunteer agencies can suffer lulls in operational tempo, thus it is important to ensure certain activities/processes are given high priority. I would assert that a risk management program ought to be considered a high priority within volunteer organizations active in disaster, such as CERT. Does CERT have a safety officer? Are written training records kept for all volunteers? Absence of Procedures…the absence of procedures for and documentation of activation, assignment, and deactivation is also a risk. Job Descriptions: Position or job descriptions are important risk management tools for most organizations. They help the organization identify risk and ensure the best fit between applicants and jobs. Managers Assume Broader Liability: Some CERT members may assume managerial responsibilities. These include the CERT leader and any section chiefs designated by that leader during an operational response. Their responsibilities require additional management, communication, documentation, and organizational skills, and their decisions may affect the safety of more people. Consequently, their liability exposures are broader than those of team members who are assigned to individual tasks. Written Permission for Minors to Join CERT: Programs that accept participants under the age of 18 should also require the youth to provide a parent’s or guardian’s written permission to participate. Waiver of Liability: Require any participant and, if the participant is a youth, his or her parents or guardians, to sign a written waiver of liability that describes the risks of the CERT program’s activities. Waivers of liability are often not enforceable under a state’s laws, especially against minors, however, a waiver that describes the activities and associated risks shows that the volunteer (and his or her parents) knew of the risks and chose to participate. Screening: To avoid claims of wrongful discrimination, screen all applicants in the same manner. Identify in advance how the program will address specific findings and equally enforce those consequences with all applicants. To avoid liability for failure to identify an applicant who poses a risk, be certain to meet state requirements for screening individuals who will work with vulnerable populations. Keep complete records of all screening results for both accepted and declined applicants, and be certain those results are addressed consistently with each applicant. Written Offer Letter: The program can avoid possible misunderstandings by putting information into a written offer letter or service agreement to be signed by the member and the member’s parents, for minors. Uniform: Require that CERT members wear ―uniforms‖ and carry program identification while they are participating in CERT activities. Statements to Media: Require that CERT members refer media representatives to a designated public relations contact. Confidentiality and Privacy:Prohibit disclosure of confidential or private information about the program, its members, the sponsoring agency and its employees, members of the public, and others. Wrongful Discrimination: Prohibit discrimination, including but not limited to discrimination based on race, gender, religion, color, national origin, age, marital status, disability, and sexual orientation. Harassment (Sexual and Other): Prohibit all harassment as well as the display of sexually suggestive or other offensive materials. Alcohol and Drug Use: Prohibit the use of alcohol, drugs, or substances that can impair physical or mental functioning while participating in CERT activities. Smoking: Prohibit smoking while participating in CERT activities. Carrying Weapons: Prohibit members from bringing weapons to CERT activities unless they are sworn law enforcement officers and carrying the weapon is part of their job. Reporting Changes in Driving Record, Criminal Background, or Professional Licensure Status: Require members to report any change in their driving record, criminal record, professional licensure, or other record required for the position they hold. Supervision: Every CERT program should assign a supervisor for its members. Discipline and Termination: A procedure for progressive discipline and termination will help the CERT program manage these situations consistently and successfully. The program should develop the procedure with the advice of an employment attorney or skilled human resources professional. Workers’ Compensation: Occasionally workers’ compensation protection will be available because the state’s workers’ compensation statute specifically includes emergency volunteers in its definition of ―employee.‖ Benefits for emergency volunteers may be subject to limitations or contingencies that do not apply to regular employees. Volunteer Protection Laws: The federal and many state governments have adopted volunteer protection laws that provide certain volunteers with limited immunity. The protection offered by state laws can differ, so this discussion is based on the federal Volunteer Protection Act of 1997 (VPA). Interstate Mutual Aid & EMAC: Some CERT programs operate teams that are capable of responding to disasters across state lines. Activities outside the home state often raise concerns about the adequacy of liability protection in the state where the aid is being provided. These concerns can be warranted, because protection varies from state to state, and CERT members are protected outside their home state only to the extent that the other state has adopted protection for emergency management volunteers. Many states’ emergency management laws protect emergency workers from other states who are responding to an official request for assistance. It pays to be familiar with the liability protection provided by the states to which the CERT(s) responds, but this can be difficult due to variation in state laws and the speed with which response takes place in the aftermath of a disaster. The Emergency Management Assistance Compact (EMAC) is a partial remedy to this challenge, but its effect is limited. Under EMAC, a responding state and its officers and employees are protected from liability. Liability Insurance: Liability insurance that covers emergency management volunteers is less likely to have some of the exclusions and limitations that leave gaps in the protection offered by immunity statutes, and, unlike immunity laws, liability insurance also provides funds to pay defense costs, settlements, and judgments. Working through the five steps every few years –especially with new participants – gives the program a fresh perspective on vulnerabilities and new ideas about strategies. Secondly, the five steps suggest how the organization can incorporate managing liability into its ongoing operations, ensuring that everyone from the chief to the newest volunteer thinks about liability when working. I would definitely recommend that CERT Program Managers read this guide in full–but not stop there. Then CERT PMs ought to take this guidance to their agency’s HR department and counsel to determine how to implement a robust risk management program for their volunteers. Most importantly, the conversation can’t stop there. There must be a risk management cycle that continues so that conversations about risks are common and routine. Just because CERT is volunteer-driven doesn’t mean we can ignore the risks, the liability, or legal implications of our actions.